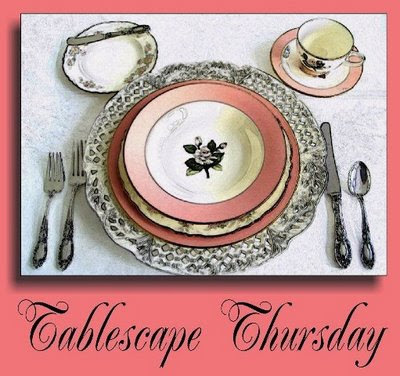 It's time for Tablescape Thursday hosted by Susan over at Between Naps on the Porch. Be sure to visit this weeks participants. This week I will share the tablescape in my living room dining area. Since I am already late posting this & I have to hurry up and get ready for our work party. I'm going to try & keep my talking to a minimum. And that will be difficult for me. I placed Santa hats on each chair. I got the Santa pants from Lillian Vernon on clearance last year. Glitter sign was from Walmart this year. The mercury glass votive cups were from Target this year. Silverware from Brylane Home. Clearance item earlier this year. Napkins from Kohl's, just got them last weekend. Dollar Tree snowflakes make great place mats. Christopher Radko dinner plates from Target. I got them about 7 years ago. But still saw them at Target this year. I did pick up the matching salad plates from Goodwill for less than $1.00 a piece. But didn't use them in this tablescape. I decided to use these salad plates instead. They are still Christopher Radko & were from Target. The silverware stockings were a clearance item from Lillian Vernon last year as well. I made the cake plate. The cloche is new. Filled it with large jingle bells I got from Joann Fabric a couple of years ago. The jingle bell garland around the bottom of the cloche came from Michael's last year. My hubby wants me to say that we will be gathering around the 120 year old pump organ to sing Christmas carols. He lives in a dream world. We don't sing in my family. But I could play Christmas carols on it, if I tried. Well I hope that you enjoyed my Christmas tablescape. Hopefully I will get my dining table in the family room cleared off & set by next Thursday. Keep your fingers crossed. Now I'm off to my work party. But I will be stopping by to visit your blog when I return if you leave me a comment or are participating this week in Tablescape Thursday. Love the red handles on your silverware and Christopher Radko of course. Happy Holiday and Happy eating. Everything is just wonderful. Thanks for the tips on the Target plates. I just love the jingle bells in the cloche. It all looks so festive! I love the centerpiece. Those bells are so sweet. I also love your layering from snowflake to stocking and everything in between. Thank you so much for giving us something so warm and welcoming to look at and visit. Very nice table, Kim! Love the holiday touches...Happy Holidays! Totally darling Kim. I love to see what you come up with. So cute with Santa's clothes here and there and the bells in the cloche. Wow, happy, happy! Sweet table. You have flair, girl. I love your table scape it is so welcoming! WoW I love this tablescape! It's really got it all! A little elegance and whimsey and lots of fun! Really cute idea to put the Santa hats on the chairs and stockings to hold the flatware! Love it!! I really love those Christopher Radko dishes too! Especially the one's with the ornament on it! Sooo gorgeous!! All the details are perfect. What a jolly table! What a jolly happy table. I love your bells in the cloche..and those dishes.I'm kicking myself now for not picking them up...scream.. May have to ask my daughter to pick them up for me.. loved my visit...Thank you for popping over.. love having you.. So pretty! I love the mix of large and small bells in your cloche! We must be soul sistas separated at birth. I bought the same snowflakes for placemats, same silverware, but at Tuesday Morning, same jingle bells for filler, and have a similar tablescape that I need to do a post on. The only thing I haven't got is those dishes. Hmmmm....don't tempt me! Enjoy singing Christmas carols! LOL! We don't sing in my house either...unless it's to ESPN! I love your holiday tablescape. The red and white Santa theme really appeals to me. I love how you used the Dollar Tree Snowflakes for placemats. Great idea. 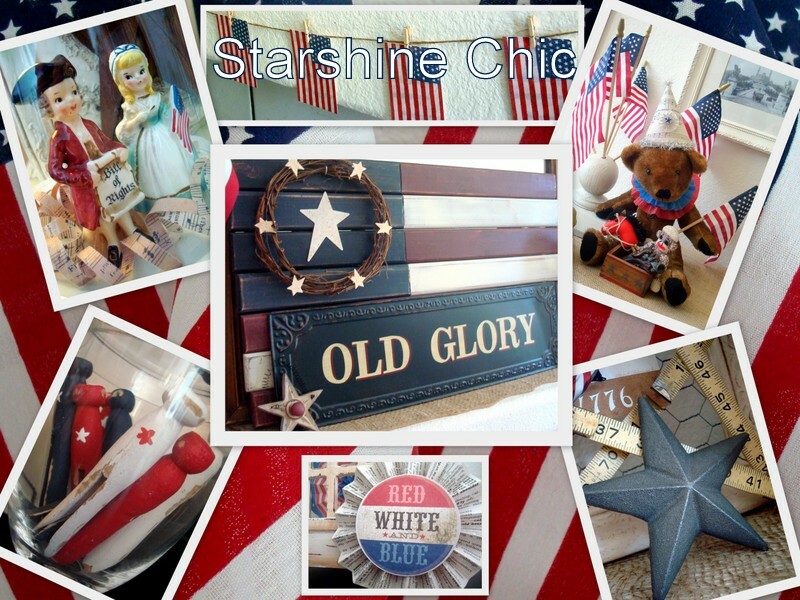 I posted tonight about the wonderful items I received in your giveaway. I'm sorry this posted later than I had planned. Some unexpected Dr. visits for my husband this week put me a little behind in getting things done. I love all of the items and I am putting them to good use. Thanks again. You have the most yummiest and festive table yet! I'm so sorry that I'm late getting by to see this fabulous Christmas tablescape that you put together! Kim, it's gorgeous...I love everything about it!!! First of all, I love your Christopher Radko plates...they're so bright and really pretty! I'd love to have a set of them!!! I love the dessert plates that you are using with the dinner plates too...simply gorgeous!!! You know, I seen the big snowflakes at the dollar store and couldn't envision what they would look like on the table...they really are pretty! Ohhh...and I'm loving the colors that you chose...love red and white together with the gold accents!!! I think your little Christmas stockings are darling and sooo cute to put your flatware in! By the way...I shop Bryant home too....shoot, I missed those pretty red handled flatware! They're gorgeous and sooo perfect with your place setting! Ooops...I'm not finished! Hehe! I really wanted to let you know that your tablescaping photos are fabulous!!! They are really good, Kim...they look like they belong in a magazine!!! Such eye candy...such a treat!!! The santa pants are the cutest thing! The red handled silverware is so pretty too. I am visiting for the first time today, but it won't be the last. I can totally relate to your info on yourself, lol. No kids but hubby does alot around the homestead. Thanks for sharing your ideas and Merry Christmas. Love the santa hats on the chairs and I have the exact same Merry Christmas piece in my tablescape! Kim, love your Christmas table, especially the jingle bells under glass!